The fact is, educational requirements for today's chiropractor are among the most stringent of any of the health care professions. Several decades ago, the education that chiropractors received was purposely narrow. Without the interest in prescribing medicines or performing surgery, chiropractic education focused on anatomy, the philosophy of natural healing, the wisdom of the body and adjusting techniques. Today's chiropractor receives a much broader education. In fact, it's quite comparable to that received by medical practitioners. 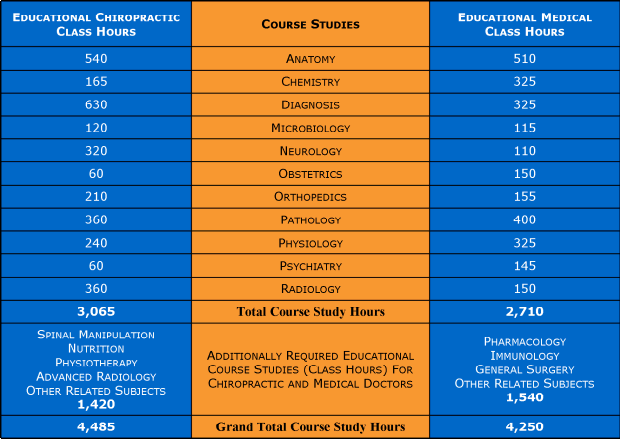 Aspiring chiropractors have to have 4 years of pre-medical classes under their belt (same as aspiring doctors) in order to enroll in a chiropractic school. This focus on science continues during the first two years of study, emphasizing classroom and laboratory work in anatomy, physiology, public health, microbiology, pathology and biochemistry. Later, the focus is on specialized subjects, including chiropractic philosophy and practice, along with chiropractic diagnosis and adjusting methods. Since chiropractors don't prescribe drugs, instead of studying pharmacology and surgery, they receive an even deeper training in anatomy, physiology, rehabilitation, nutrition, diagnosis, X-ray and a variety of adjusting techniques that aren't taught in any other health care field. Disparaging the educational achievements of today's chiropractor is an outdated belief from another era.